Young children and grief is not an easy combination to know how to handle. My son was 18 months when his dad died. It was certainly hard to know how his young mind was processing the disappearance of one of the key people in his life. I will discuss more of that journey on other pages. 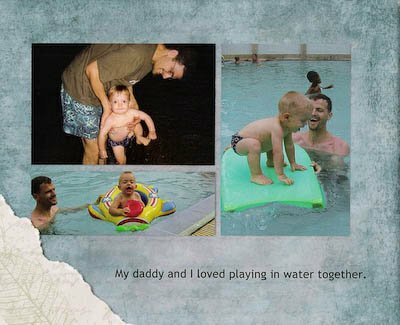 On this page I want to share how I made a story book to tell my son about his dad's death. In working with children and grief, memory books may be an important way to help them process their emotions. Pictures and stories help them remember their loved one and the feelings they had for that person. Reading through the memory book together creates opportunities for the two of you to share feelings of sorrow. You can use a paper scrapbook or a digital memory book, such as Picaboo to tell the story of the death of your child's loved one in a way that will understandable and meaningful to him or her. If you've explored much of this site, you will know that I love working with digital photos and books. If you are new to creating scrapbooks, there are many companies online that make it easy to create beautiful memory books. For my son's book, I wrote in the first person (as if he were telling the story). I started with his birth and how his daddy was the first person to hold him after he was born. I then used many of the photos I had to tell of the various activities the two of them enjoyed together. The key for this young age is to keep it like a child's picture book--one or two large, interesting photos with only a line or two of simple text. In my book over half of it consisted of memories. 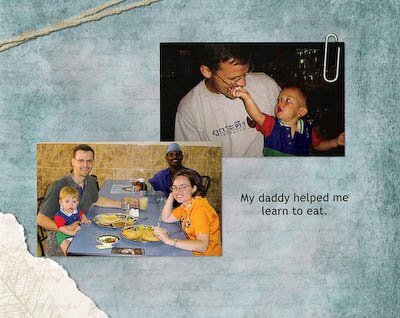 For example, “My daddy and I loved to sing and dance together.” “My daddy helped me learn to eat.” “My daddy gave me my first haircut.” Each of these lines are accompanied by photos of the two of them. The memories section was followed by a simple explanation of his dad's death. I wrote about how sad this event was for us and our family and friends. The last pages of the book included ways that we find courage to keep living, how we deal with the sad moments when they are present, and ways we find joy in our life now. I began reading this book to my son when he was about three and a half years old. He had just started to ask about why his friends had daddies and he didn't. He loved the book and asked for it to be read over and over. The women in the preschool carpool later told me that on several occasions he explained his dad's death to the other kids. At this stage, his explanations came nearly word for word from the book. I have a friend who is a therapist. When I told her about writing this page, she told me that she had a client who had recently lost her husband. She worked through her grief by creating scrapbooks. But her teenage son was having a very hard time. My friend referred him to a male therapist who had also lost his dad as a teenager. A few months later she checked in with this therapist to ask how the young man was doing. The response was, "he's doing well--he got into scrapbooking too." Scrapbooking isn't something we normally envision a 6 foot teenage boy doing with his free time. But I have found that the best way to work through grief is self-expression. It also seemed to be the case of this teen. So if you are creating a memory book for older children, see if they wish to be involved in the process. Of course, you would want to be sensitive to the stage they are in and whether or not they are ready or able to engage to process. They may have specific memories that they wish to be portrayed in the book. They may also be able to come up with explanations on how they find joy and reason to keep living. Some days are easier than others for this. If they are old enough to work on the computer without much supervision, they may enjoy working with one of the digital memory book programs to express their feelings of loss and sorrow. My Memories Suite would be an especially good program for children because they can print out as many pages/books as they want from your home printer. They could also create posters and wider variety of other photo products. If you're feeling short on time, make a ritual at one or more mealtimes during the week to go around the table and tell a memory of your loved one. Write up the stories as they're shared. The younger children will enjoy hearing the memories of the older members of the family who had a longer history with the person. Read this article for general tips about children and grief.